StarCraft II is a real-time strategy game in which players compete against each other for control over resources and attempt to eliminate the enemy player’s forces. In the game players must create and manage armies by gathering minerals and building supply depots. A player’s army maxes out at 200 supply and each unit takes a different amount of supply to place on the battlefield. In addition each unit has a build time that must be completed, with enough supply available, before the unit will be available for use. Players start the game with workers that simply gather resources and construct buildings. Once a specific type of building is completed players can begin developing their military force. For example: If a player builds a barracks then after it is complete they will have the ability to train marines from the barracks. This applies to every unit in the game. Each unit has a corresponding building that must be completed before they can be built. Players can expand their force by gathering additional resources from nearby nodes but the nodes on each map are limited. Players face the difficult decision of expanding and increasing their forces or attacking in hopes of winning. The tradeoff comes when you realize that the longer you wait the stronger the enemy is becoming as well. Players must also make game changing decisions in regards as to which units to create. Each unit in the game has a counter unit and if a player does not see it coming they will be out of the match before it has even begun. Additionally certain units have special abilities that the player must manage, making the overall gameplay very emergent and unpredictable. The outcome of a game can be made by a single decision or by a simple error at any point in the battle. StarCraft II has a fairly simplistic interface for a game that is so complex. The majority of the screen is the play area. In the upper right corner of the screen you can see the mineral count (blue crystals) followed by the gas count (green barrel) and finally the supply (pylon). In the extreme top right corner is the social panel where players can check on friend status and communicate with others outside of the game. In the bottom right corner we see the status panel. The panel shows the options available to the player in regard to the currently selected group, unit, or building. Above and to the right of the action panel going from right to left is the menu button, used for changing settings, the friend list, and the help button. Directly to the left of the action panel is a character image that represents the currently selected unit or building. The large panel in the bottom center of the screen is the selection panel. 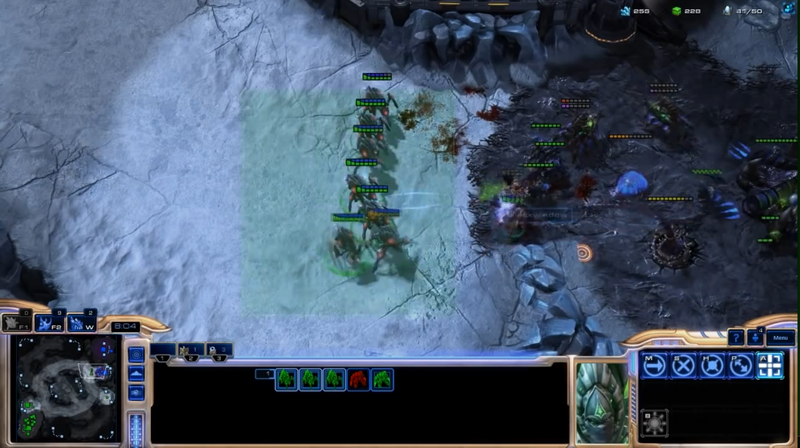 This panel shows all units, buildings, or groups that are currently being directly controlled by the player. It also displays the unit’s health and status information. Notice the three small boxes attached to the top left corner of the selection panel. These are groups created by the user that can be toggled through for quick access. In the bottom left corner is the mini-map of the current stage. Green units on the mini-map are friendly units while red ones are enemy units. Around the map starting in the top left and moving clockwise are the quick action keys, the play clock, ping (concentric circles), terrain (mountain button), and diplomacy button (handshake symbol). These allow the player to alter the mini-map for things like color-blindness and friendly/unfriendly unit coloring. There are far too many strategies to name them all and they are constantly evolving because of the emergent quality of the game. Therefore I will mention the most commonly known and simplest strategies. Rushing involves the player building a small amount of units in a very short amount of time. The player then attacks their opponent in hopes of getting an early kill. This is a huge tradeoff because if the enemy player defends the attack they will have a better economy usually resulting in a loss for the rusher. This is the opposite of rushing. A turtling opponent barricades themselves into their own base. If the enemy can’t successfully break the opponent’s barricade they will lose units to their defenses eventually leading to a loss for the attacking player. This too can be a tradeoff strategy. If an opponent barricades themselves in too early they run the risk of letting the opponent expand throughout the map, gaining resources that will eventually allow them to win. This strategy involves using small amounts of units to make tactical strikes at the enemy’s infrastructure. An example would be to use flying units to kill off all of the enemy’s workers resulting in a stale economy and eventual loss for the player. This type of strategy requires a lot of focus on the harasser’s part and can leave them blind to a counterattack. Because each map has a limited amount of resources players are forced to fight at some point in the game, it is inevitable. Because the strategies in the game are only limited by the imagination of your opponent, gameplay is constantly evolving and counter strategies are constantly being created to defeat the current “meta-play”. I used to play this game competitively; I probably should pick it up again. I forgot how much fun and how challenging it can be. This game spawns many different game ideas. Taking the emergent aspect of the gameplay and applying it to other genres would be a boon to whoever can develop something like that. For example, I would love to see an espionage game where players go head to head trying to steal information from each other. The players could take turns in a best of 3 type of situation. I don’t know if a top-down RTS style game or a full 3D game would be better for this, but it would definitely be interesting to see.